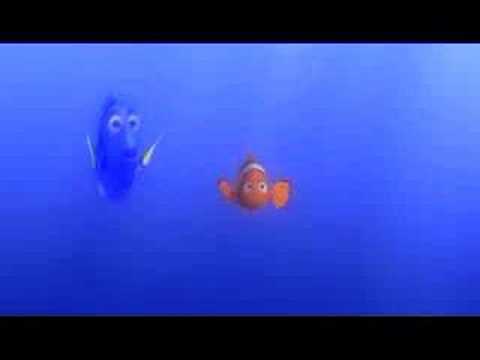 Finding Nemo is a 2003 American CGI animated film. It was written by Andrew Stanton, directed by Stanton and Lee Unkrich and produced by Walt Disney Pictures and Pixar Animation Studios. 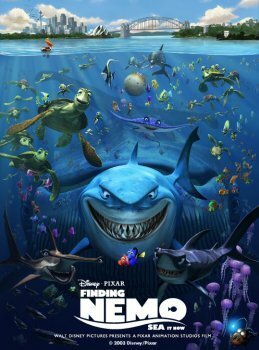 It tells the story of the overly protective clownfish Marlin, voiced by Albert Brooks, who along with a regal tang called Dory, voiced by Ellen DeGeneres, searches for his son Nemo, voiced by Alexander Gould. Along the way he learns to take risks and that his son is capable of taking care of himself. The film received overwhelmingly positive reviews and won the Academy Award for Best Animated Feature. It was a financial blockbuster as it grossed over $864 million worldwide. It is the best-selling DVD of all time, with over 40 million copies sold as of 2006 and is the highest grossing G-rated movie of all time. In 2008, the American Film Institute named it the tenth greatest animated film ever made during their 10 Top 10. It was also the first Pixar animations studio film not to be released in November.